Tue., April 3, 2018, 3:42 p.m.
Doug Ferguson: Chaos at the Champions Dinner: Where to sit? AUGUSTA, Ga. – Rory McIlroy paused under a towering Georgia pine just off the 14th green, mimicking a swing and going over some of the finer points of Augusta National with practice partner Ian Woosnam. Woosnam, after all, has one of those coveted green jackets. McIlroy needs one to join a very exclusive club. Funny thing, it looked like the Masters would be the first major championship of McIlroy’s career. In 2011, riding the hype as the game’s brightest new star, he led after each of the first three rounds and was still out front making the turn Sunday. Then, in one of the greatest collapses in major championship history, he played the final nine holes at 7 over to shoot 80 . At the time, it felt like his world had collapsed. Looking back, he considers it a turning point in his career. A few months later, he won the U.S. Open in a runaway. The next year, he added a PGA Championship to his resume. In 2014, he captured two more majors at the British Open and the PGA. Only the Masters is preventing him from joining Jack Nicklaus, Tiger Woods, Gary Player, Ben Hogan and Gene Sarazen with a career Grand Slam. McIlroy was clearly in a relaxed mood as played the back nine late Tuesday afternoon with Woosnam, the 1991 Masters champion, and Branden Grace – long after many patrons had already headed home for the day. Before teeing off at the 14th, McIlroy posed for a picture with a boy clad in burnt orange from head to toe, whose father insisted “he’s your biggest fan.” Someone murmured from afar, “He said the same thing when Rickie Fowler came through,” and certainly the young man was dressed in attire more appropriate to Fowler’s fashion sense. As McIlroy headed to the 15th tee, a man asked, “Can I shake your hand?” McIlroy kept right on walking but shouted back, “I’ll get you on my way back.” The patron looked a bit skeptical, but McIlroy was true to his word after hitting a booming drive. He found the man along the ropes, veered off for a quick handshake, and headed on down the fairway, getting smaller and smaller before he disappeared over the horizon. “All it takes is one guy to do that, and you’ve got a fan for life,” another patron said, smiling approvingly. If anything, McIlroy feels like he’s given this place a little too much respect the last few years. He’s certainly played well, finishing in the top 10 the last four years, but he seemed to get a little too comfortable settling for pars instead of going for birdies. “Sometimes you plod away and you make your pars and think you’re doing OK, but you look at the board and you might be seven or eight back (because) someone’s got off to a hot start,” McIlroy said. “I don’t think that will happen this week,” he added confidently. McIlroy is very mindful of the history around this place . Hogan and Sam Snead both won their first Masters on their 10th try. This is McIlroy’s 10th appearance. Arnold Palmer was 28 when he captured his first green jacket. McIlroy won’t turn 29 until next month. 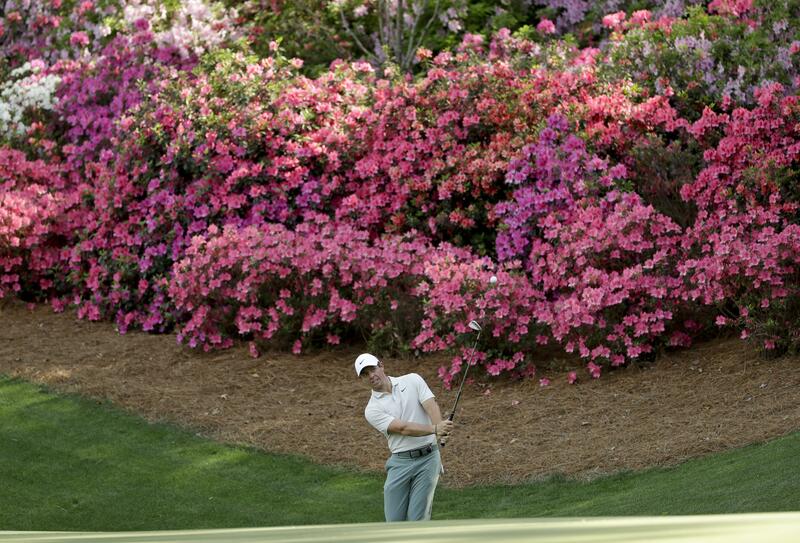 McIlroy sees no reason why this Masters can’t be the one that pushes him into elite company. “I never come in here thinking I’ve served my time and this is my turn – because it’s never your turn. You have to go out and get it,” he said. Follow Paul Newberry on Twitter. His work can be found here. Published: April 3, 2018, 3:42 p.m.